As we approach the eagerly awaited transition from darkness to light, from lies, arrogance, stupidity and pig-headedness to rationality, healing and creative collaboration—-I have a question. 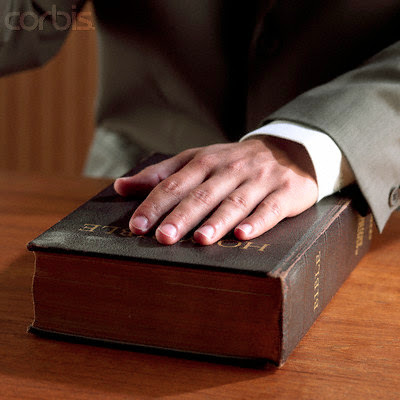 I know I’m a voice crying in the wilderness, but why is the oath of office taken by the president always and only on a bible? Why in a nation, one of whose founding values was separation of church and state, isn’t the oath taken on a copy of the United States Constitution? That’s the document the president is swearing to uphold and defend, not the Book of Ruth, Numbers or Genesis et al. The little plastic figure is of an Italian man, his legs stuck in a barrel of cement, who's name is Al Dente. He was a gift from Fritz for Christmas. Stereotype that he is, he is of course massively politically incorrect. But let's just skip over that because Al is a pasta timer. The way he works is that once your cooking water has come to a boil, you dump in your pasta and then drop Al in after it. In my best husky Godfather voice I told Fritz, "he sleeps with the rotini." Being Italian, Al likes opera, particularly Verdi, which is the real reason Fritz gave him to me. Depending on the cooking time of your particular pasta, Al lets you know when it's done. After 7 minutes, Al plays the triumphal march from AIDA. After 9 minutes, Al plays the elegiac "Va, pensiero sul'ali dorate", the chorus of captive Hebrew slaves from Nabucco. And after 11 minutes you get the lilting "La donna e mobile" from Rigoletto. Each selection is repeated twice in case you like your pasta just a bit more done. Al has a life span of eighteen months after which his music is silenced forever. Al Dente is a product of BrainStream GmBH in Oerlinghausen, Germany www.brainstream.de and I imagine it can be googled. 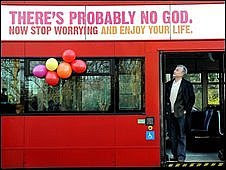 A Christian bus driver has refused to drive a bus with an atheist slogan proclaiming "There's probably no God". Ron Heather, from Southampton, Hampshire in the UK, responded with "shock" and "horror" at the message and walked out of his shift on Saturday in protest. First Bus said it would do everything in its power to ensure Mr Heather does not have to drive the buses. Buses across Britain started displaying atheist messages in an advertising campaign launched earlier this month. Mr Heather told BBC Radio Solent: "I was just about to board and there it was staring me in the face, my first reaction was shock horror. I felt that I could not drive that bus, I told my managers and they said they haven't got another one and I thought I better go home, so I did. "I think it was the starkness of this advert which implied there was no God." When he returned to work on Monday he was called into a meeting with managers and agreed to go back to work with the promise he would only have to drive the buses if there were no others available. First Bus said in a statement: "As a company we understand Mr Heather's views regarding the atheist bus advert and we are doing what we can to accommodate his request not to drive the buses concerned. As an organization we don't endorse any of the products or sentiments advertised on our buses. The content of this advert has been approved by the Advertising Standards Agency and therefore it is capable of being posted on static sites or anywhere else." The advertising campaign is backed by the British Humanist Association and prominent atheist, Professor Richard Dawkins. Hanne Stinson, chief executive of the British Humanist Association, said: "I have difficulty understanding why people with particular religious beliefs find the expression of a different sort of belief to be offensive. I can't understand why some people seem to have a different attitude when it comes to atheists." Pressure group Christian Voice has questioned the campaign's effectiveness but the Methodist Church said it would be a "good thing if it gets people to engage with the deepest questions of life" and suggested it showed there was a "continued interest in God". There's something wonderfully English about "bendy" busses. I'm picturing Al as George W. Bush....going into a pot of boiling water on Tuesday. And, my friend, I don't think you're a voice crying alone in the wilderness at all....I think you have millions of backers! First off I love the idea of the pasta timer. What a great invention particularly for someone, like me, that is kitchen-challenged. I never know when to shut the pasta off. What the hell is a rolling boil anyway? Isn't that some abscess you get on your back that transcends elsewhere? Anyway, as for the British bus. I salute Mr. Heather for taking a stance against advertising religion (for that's what atheism is) on the job. Something tells me a advertisement saying "believe in Jesus" or "repent the end is near" never would have made it on a bus. I have no tolerance for discrimination on either side. Somehow we tend to think it's okay to "reverse stereotype", for lack of a better phrase. Rick, let me assure you that there are plenty are religious advertisements on buses, and not just for 'appearances' of preachers. The atheist adverts were a direct response to the glut of religious advertisers. I don't suppose Mr Heather takes such a stance against buses with adverts that eg promote films that glorify violence or subjugation of women. Gert, you make a very good point. The Religious Right as we call it here or fundamentalists in general are extremely selective in their reading of the bible. Lots and lots of things that are proscribed there (wearing clothing with mixed fibers, women speaking in church, touching or wearing anything mad of pigskin, etc.) are ignored all the time--the only one of the famous 23 forbidden things that they insist MUST be is enforced is the one about men sleeping with men. Women are still being objectified and exploited, violence in this country is still as American as Mom and Apple Pie; movies and video games in particular are major purveyors of torture, cruelty and extreme violence. Of course, Christianity's history is full of those things also.